InSinkErator is a household name, they manufacture a wide range of garbage disposals and they are a leading figure in the industry. The Badger series disposals by InSinkErator are known for their efficiency as well as affordability. InSinkErator is keen on adding new technologies to their products, it is the only company that uses multi-stage grinding technology in its products. They also make the quietest garbage disposal. 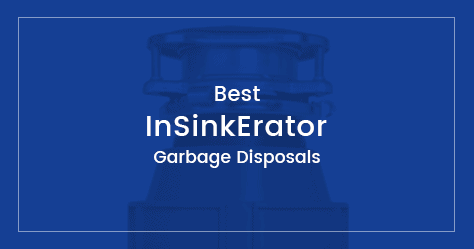 It is no wonder that InSinkErator is the leading figure in garbage disposal industry considering the fact that they are the actual inventor of garbage disposals. In 1927 architect John W Hammes built the first garbage disposal. The Badger series by InSinkErator has economical models of garbage disposals. These disposals are usually cheap and have only the basic features. This is the most sold category of garbage disposals by this brand. InSinkErator Badger 1 is one of the cheapest food disposers. It is priced somewhere below $100 which is great for those wanting a budget-friendly disposer. Tough cheap it gets things done, which is important. This is suitable for small households and college dorms where disposers are not used frequently. Shipping Weight (Approx.) : 13 lbs. Being one among the cheapest priced disposer, this is a useful disposer to spend money on. In terms of size, it is 7 x 7 x 12 inches. It is small and can fit in tightly fitted areas under the sink. Though cheap it can last a long time provided that it is well taken care of. The unit is small with a 26 oz. grind chamber and a 1/3 HP induction motor, meaning it will not be able to grind hard and fibrous food wastes, this means hard bones, thick fruit peels and big chunks of food waste will be an issue. With its small power capability, it isn’t made to handle a large amount of food. However, for a bachelor or a college student (and those who don’t throw parties often), this is suitable. It isn’t discreet in noise making as other disposers with a noise suppression technology. Nonetheless, it isn’t too loud when in use. I feel that the noise is manageable once you get used to it. Unfortunately, the unit does not have that many additional features to boast. However, the grind system is galvanized steel, so the shredding of your soft foods will be easy. Despite all these, the installation is quite uncomplicated. There is no need to change mounting brackets if you are going to replace an old Badger with this new Badger unit, as the mounting collar is applicable to other disposers. It can be installed with no additional plumbing work. Pls note that Badger 1 doesn’t come with power cord, it needs to be purchased separately. Facing the facts, the Badger 1 unit is not as great as Badger 5. 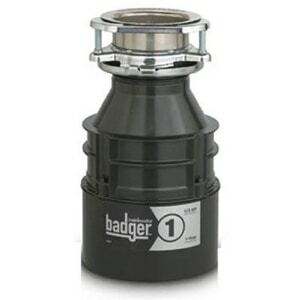 To compare the Badger 1 with other disposers, its advantage is the low price tag. Some of the consumers also mentioned that the unit works fine but eventually cracks and leaks. But I did notice that most Badger 1 owners that complained that the unit prematurely dies and cracks, has the unit for 3 to 5 years. Some complainants even had it for 10 years and more. A basic understanding that it is not made for heavy duty performance is a must to be able to take care of the unit properly. If it is well cared for, it can last for a long time without any concerns. Again Badger 1 is convenient for those who cook occassionally. It has a voltage requirement of 120 volts. It weighs at 12.7 pounds and is quite small which is perfect for space saving. Comparing it with Badger 5, the Badger 1 has 1/3 HP while the Badger 5 has ½ HP. Both units have the same size and same grind chamber, 26 oz. The Badger 1 has 1-year warranty and the Badger 5 has 2 years warranty length coverage, and both don’t come with a power cord. And if compared with the Evo Spacesaver, both units have 1725 rpm and has a voltage of 120. But with grind chamber, the Evo Space saver has 34.6 oz. capacity and the Badger 1 has 26 oz. only. But there is a large price gap. The unit is covered for 1 year. This fairly good for a small unit. Again, as stated earlier, a well-taken care disposer will last long with no serious problem. But in case a problem arises, first identify the issue very well, call a repair service and describe the problem thoroughly and do not forget to inquire about the unit warranty. Also, ask the customer service representative if the parts and labor will be covered or if you have to purchase any additional parts for repair. Coming down to the pros and cons of the Badger 1 unit, here are the conclusions that I gathered about the unit. In the end, the unit needs proper care and usage to last a very long time. With installations, there wasn’t much trouble in taking out the old sink flange and having to put in a plumbers putty in the Badger 1 unit as the current one installed in the sink was just fine. Despite having lots of drawbacks, it still has a solid customer base, it is a proven product and been in the market for a long time. It is advantageous in terms of cost saving but a bit on the flat side with power and capabilities. But then again, if you only need a basic disposer, then this is the unit to buy. InSinkErator Badger 5, 1/2 HP Food Waste Disposer has been the best selling garbage disposer in Amazon.com for a long time. The bagder line offers a wallet-friendly solution for waste disposal. The 1/2 HP motor is more than capable of perfectly juicing organic wastes like fruit peels, vegetables, meat and even small bones. It uses a single-phase Dura-Drive induction motor and is capable of running at a speed of 1725 RPM. The single stage grinding system with two rotating hammers delivers enough crushing power to liquefy most household wastes. The InSinkErator Badger 5 is not exactly a silent gadget, in fact, it is noisier than most of the high-end disposers. But considering the cost factor, it is easy to forgive this extra noise. Shipping Weight (Approx.) – 14 lbs. Grind Chamber Capacity – 26 oz. This disposer is made of Galvanized steel and has a chamber capacity of 26 ounces which is enough for a small family. It has an approximate width (radius) of 7 inches and a height of 13 inches, a compact design suitable for any sink. The InSinkErator Badger 5 comes with a quick lock sink mount, a sink baffle, stopper, discharge tube and a wrenchette. It is easy to mount especially if you were using a similar waste disposer like its 1/3 HP version. Step by step installation directions is given in its installation manual. It comes under a warranty of 2 years with any maintenance/repairs done free. 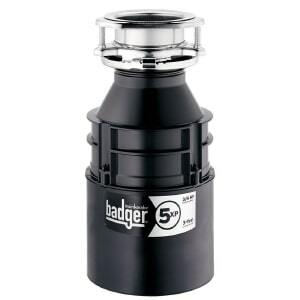 InSinkErator Badger 5, 1/2 HP Food Waste Disposer is the best selling product in its category. So far it has got 2400+ positive reviews which show how much popular this disposal is. Like every product, this has some cons as well. Some users, though few when compared to the overall rating, had leaking issues resulting from the cracks on the disposal units. For most these issues happened after a service of 4-6 years, well out of the warranty period. Other than this, Badger 5 is the most desirable economic garbage disposal. Some products have it all, and some just have the basic necessities. Somewhere in the middle is the product you need, with just enough exciting new features to make pulling out your wallet easier, but a low enough price that you don’t wish you went with the basic product instead. In that case, the InSinkErator Badger 5XP is the right product for you. With InSinkErator’s Badger 5XP, you can feel confident about the disposer you’re buying, and even better about the price you’re spending on it. InSinkErator has been providing its customers with quality products at reasonable prices for over 75 years, and its standard Badger line is straightforward, dependable, and efficient. 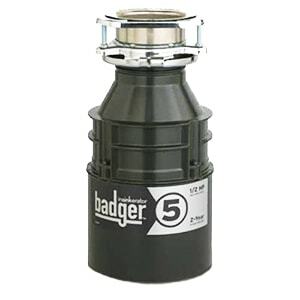 At ¾ HP, the Badger 5XP grinds more food waste more quickly than many other disposers, and its 26oz grind chamber allows you to grind a lot of food waste in a short period of time through its continuous feed. Its GrindShear Ring makes tough food waste like chicken bones or watermelon rinds easy to grind, and virtually liquefies the food in its chamber. Let’s look at some of the other features of the Badger 5XP that have helped the InSinkErator brand become the first choice of 9 out of 10 plumbing professionals. Shipping Weight (Approx.) – 15 lbs. The Badger 5XP is backed with InSinkErator’s exclusive We Come to You 3-year In-Home Limited Warranty. Yes, you read that right. If something is wrong, InSinkErator will send one of its 1500 professional service agents to you as a complimentary (read, free) house call, including parts and labor, for the entire warranty period. As with any warranty service, you should make sure to save your receipt and register your Badger 5XP with InSinkErator in case any issues arise, but many customers I know say their Badger 5XP disposer lasted long beyond the time the warranty expired. Like all InSinkErator brand disposers, the Badger 5XP comes with the Quick Lock sink mount feature, allowing you to “twist off” your previous InSinkErator disposer and “twist on” the new one. If you didn’t have an InSinkErator before, the initial installation may be a few more steps than a simple “twist off, twist on,” but it is a definite plus if you plan to stick with the brand. The Badger series is generally less expensive than other ¾ HP InSinkErator products and other brands, and the Badger 5XP is no different. Its low price can be maintained for a couple of reasons. InSinkErator keeps the Badger 5XP compact. At just over 15 pounds and a 7 x 7 x 16 inch frame, this disposer uses less material than comparable products, meaning that the manufacturer can pass those savings off to you. And it doesn’t hurt that it takes up less space under your sink, giving you more room to store all those plastic grocery bags and cleaning supplies. It does not come with a power cord, but you can easily attach the cord from your old model, or purchase a new one. What it does come with are various reports concerning the amount of noise this disposer produces. While some reviews mention higher than average noise levels, others say the unit has normal sound levels or is even quiet. If you’re looking for a disposer that is made to be quiet, but is still inexpensive, you’re probably not going to find it. You’ll either need to spend a little more money on InSinkErator’s Evolution series or consider purchasing an inexpensive quiet collar sink baffle to help muffle the noise. Despite an awesome warranty, the Badger 5XP is just like any other disposer; it isn’t built to last forever. The galvanized steel grind system makes it an extremely durable machine, and, paired with the speed of the single-phase motor, generates an impressive grind, able to cut through some pretty tough food waste. But while this is designed to last, the housing that holds the unit together is not. The disposer’s plastic housing has been known to crack. This can happen over time as the high temperatures the unit produces can cause the housing to warp and eventually crack. The good news is that in the few reports when the housing has cracked, the product has been under warranty, meaning that you could easily arrange for one of those free house calls and parts replacements. If you’re looking for a disposer that does its job consistently and does it well for a few years, then this is the product for you. With its price tag, high horsepower, and hard-to-beat warranty, you can’t really go wrong. InSinkErator Evolution series garbage disposals are known for their features. They are top-end models with every possible feature crammed into them. They also come with a much better build quality and design than the Badger series disposers. The most desirable qualities of a garbage disposal are grinding power and noise reduction. Then come the look and design. The InSinkErator Evolution Excel is an excellent product with brute grinding power, zero noise and a great design! No doubt this is a premium product and costs many $$s, but make no mistake, it is definitely worth the price. If budget is not an issue for you then Evolution Excel is the best food disposer available in the world! Evolution Excel is crammed with all the features you can have in a garbage disposer, it is built with stainless steel, rust-resistant, has a shiny, eye candy design, it is anti-jamming, easy to mount, multi-grind technology, ultra quiet, blah blah blah…, it is a shame to hide such a beautiful product under the sink. This is the quietest garbage disposal ever! 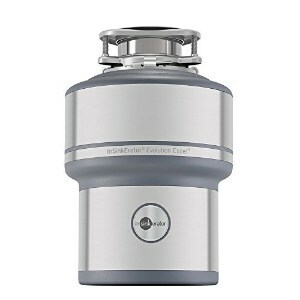 and is our choice for the ‘Best Garbage Disposal‘. The Evolution series features a dozen or more improvements over the popular Badger series line. And the Excel has one of the most powerful and efficient grinding systems I know of. Shipping Weight (Approx.) – 25.5 lbs. Grind Chamber Capacity – 40 oz. The Evolution Excel is highly recommended by many customers due to its awesome features and power. For all the Apple fan boys over here, it is like an iPhone, it is beautiful, smooth and gets things done. People really really love how quiet it is (yes, I have mentioned this above multiple times, and will mention it again ) One customer even stated it is so quiet that he had to check the drain to make sure it was actually working. The entire unit is designed to be as quiet as possible. The InSinkErator Evolution Excel disposer comes with SoundSeal Technology which is a collective name for all the sound proof things done on this disposer. The hardware for drain and inlet and outlet ports on this machine are also reinforced to reduce any vibration that could potentially occur. Another feature I really like about this disposer compared to the more conventional units on the market is the MultiGrind Technology. The Evolution Excel breaks down food through three stages of grinding. I don’t want to bore you with the details, so let’s just say that it will take out a whole chef salad complete with chicken wing bones and potato peels on the side. This disposer has technology built in to deal with jamming as well. If the disposer senses jams, it automatically increases power up to 500 percent. It also reverses its running direction if it comes across something it cannot handle. The Evolution series comes with a very generous warranty. The people at Insinkerator offer a seven year come-to-you warranty on their Evolution Excel disposers. It is pretty easy to install especially to switch your current InSinkErator disposal with this one. If you want to install this beauty yourself, you can just twist and lock the disposer onto the existing InSinkErator drain. If you are not replacing an old disposer, you may need some plumbing fittings and pipe to complete installation, which is same as installing any other food waste disposal. It comes with instructions and a user manual to guide you through installation. IS THE HIGH PRICE WORTH IT? The Evolution Excel comes with a hard to digest price tag. However, if you are looking for quality and performance this is the model to get. I also believe that, if you are a firm believer that you get what you pay for, this disposer comes highly recommended owing to it’s function and advanced features. Extra powerful induction motor for heavy duty service. Seven year warranty with a three year warranty on all parts. I have great respect for the InSinkErator brand and their products. The Evolution Excel garbage disposer boasts advanced technology for serious grinding with little noise while operating. If you want to have a hassle-free kitchen where nothing goes wrong at the worst possible time, this tough disposer can make your worries a thing of the past. A high-end, compact garbage disposal at an affordable price = InSinkErator Evolution Compact. This is the 3rd best food disposers I have ever reviewed, and unlike the best two, this one is better priced. The Evolution Compact comes with lots of features which you can see in high-end food disposers, it also has a more compact design than the latter. Shipping Weight (Approx.) – 19.5 lbs. Grind Chamber Capacity – 34.6 oz. It is a disposal unit from the Evolution series and as mentioned in the name, it is compact. This unit is relatively smaller than the other Evolution series disposers but has more or less the same chamber capacity. It can hold about 35oz. of food wastes and has dimensions 8x8x12 inches. The grinding motor packs 3/4HP which is ample power for a garbage disposal of this size. It is also equipped with Multi-Grind technology in which the food wastes undergo grinding through two stages which include a GrindShear Ring and Tri-Action lug system. The Evolution Compact is capable of grinding even small chicken bones which are not possible with low-end disposers. I also noted that against a standard disposer, the level of quietness while operation is relatively outstanding. It uses SoundSeal technology which can only be seen in the top InSinkErator models like the Evolution Excel and Evolution Essential. This is the 3rd best disposal I have reviewed in terms of quiet operation. Of all the things that come with the unit, the quick setup, or as others call it, installation is a breeze to do. The manual is comprehensible and you wouldn’t get lost with the process. A home and a kitchen owner like me who has a lot on their hands need things to be done as soon as possible. That is why the easy twist on and off of the disposer for locking is handy. The Evolution Compact has some accessories included in the package. The unit comes with a sink baffle, jam-buster wrench for unexpected clogging, anti-vibration tailpipe mount to give you added silence, clamp, and a stopper. In terms of the warranty, InSinkErator Evolution Compact disposer comes with a 4-year in-home limited warranty. That includes the parts and service to be rendered for the repair. Within the four years, it is absolutely recommended to always call in for a technician for any unusual noise or functioning of the disposer. Do not shrug them off since there are only four years in the warranty tag. To give you a clear view on how I assess the unit, here are some of the noticeable pros and cons of the disposer. In the end, This is one of the best garbage disposals I have reviewed. Its compact size and lighter weight make it much easier to mount. With the price, it ranges with typical disposals in the market that has 3/4 HP in the motor. It is decently priced, the quality is good, and is nicely designed. Overall this is a product worth buying. There are other disposers in the market that bring more grinding. power One example is the InSinkErator Evolution Essential. Though powerful in working, it is a bit expensive. So if you are looking for a disposer within the Evolution series but doesn’t like the small sized ones like the Evo Compact and Evo Space saver, then the Evo Essential will be able to deliver your needs. What makes the Evo Essential different from the rest of the Evolution series disposer will be provided below so that you will have a better glimpse of the working condition of the unit. If the sink clogs up often and it’s time to replace that rusty old leaking disposer, the Evo Essential can be a strong replacement. The unit is among the big disposer of the Evolution Series. It measures at 14 x 10 x 13. This is far bigger than the Evolution Compact and in the same size as of the Evolution Septic Assist, and Premier. It has a good 40 oz. capacity of holding grinded food waste. It is far better than having a limited capacity. Anyway, I would recommend getting disposers with bigger capacity especially if you have room to spare under the sink. In terms of motor power, it seems to be working pretty well. Anyway, it has ¾ HP, so it should be performing as expected. The electric motor consumes about 110/120 volts of electricity. Speaking of HP, I also recommend getting disposers that comes with a ¾ Hp and not anything less than that. Because if it is the grinding power that you are after, the bigger the HP the better, if you go lesser than the standard ¾ power, you end up getting more jams in your disposer and it will take you longer to grind up food scraps. And this is an infuriating situation because you have to do extra effort to get rid of the clog. The Evo Essential is also a bit heavy because it is 25.3 pounds. You will be needing help to have it installed just like what I did. You see, the thing about the Evolution line of InSinkErator is that it’s often broader than most regular models out in the market, which means that you will be needing to cut down some pipes to make way for the disposer. That is why before purchasing a unit, you have to do some basic measuring on your sink so that you don’t have to be shocked with the unit being a tad too big for the sink. The warranty covers a 6 year in home Limited Warranty. It’s great since it covers the parts and services. But it wouldn’t be great for someone who is only renting an apartment or a house that will be moving out in the next 3 or 4 years. The disposer comes with other essential components such as the quick lock sink mount, sink baffle, jam wrench, anti-vibration tailpipe mount, clamp, and a stopper. You have everything for the unit to work properly, but you have to buy a plumbers putty for it to be installed. It’s not included in the package and its a bit disappointing too. But if you don’t mind taking a trip to the plumbing supply store then you wouldn’t mind it at all. The grinders are working well. Though it takes a longer time to grind everything up, it can still get the job perfectly done. Take in mind that the unit is built to be quiet. And one way of keeping it quiet while working is the rubber on the sink that was designed to drain slowly to reduce vibration noise. That means slower draining. If you are not used to a slow draining disposer, you can simply snip off the pieces of rubber to make draining faster. However, I do not recommend this be done as it can affect the grinding noise. Now that we are almost in the end of this unit review, here are some pros and cons that I found out from the unit that you will find useful in deciding whether t buy it for your kitchen. In the end, I would recommend the InSinkErator Evolution Essential for those looking for a disposer with a good HP in the motor and has enough budget to buy it. For the price, the Evo Essential works pretty tough and doesn’t seem to jam at all. The only downside I see on it is that the power cord is not included like in other disposers by ISE. I decided to make use of my old one but decided to buy a new one instead. It was a new unit and I think a brand new cord should go with it. With this being said, it would have been nice to have a power cord included. Also, the rubber eyelet in the sink restricts the water flow going into the disposal. It’s good because you will be able to save a bit in the disposer water consumption but can be bothersome too if you like a fast draining action. Ofcourse the Evo Essential is an ideal unit for large under sink spaces. It is also perfect for those looking for a quiet unit but can grind up food scraps very well. Thus, you will definitely get what you paid for in this InSinkErator Evolution Essential disposer. Not all InSinkErator disposals have this, only the top end models have. Sound seal technology is basically a noise insulation technology that prevents garbage disposers from being loud. This technology enables InSinkErator to come up with really quiet disposals. You can check my list of best quiet disposals for more info. Some top end models use more than one grinding stages, this is called multi-grind technology. This helps easy grinding of tough food wastes into very small sizes. There are 2-stage grinding systems like in Evolution Essential and 3-stage systems like in Evolution Excel. People often confuse this with having two or more sets of turntables but that’s not the case. A 3 stage grinding system means that it has two more sets of grinding components, in this case, a shearing ring along is disposal’s wall and a lug system which is similar to the cutters on the turntable. The mounting of InSinkErator garbage disposers are easy. They all use a Quick-Lock mounting system where you can easily lock the disposal to an existing sink mount with just a twist. InSinkErator garbage disposals do not come with power cords. That being said you have an option to buy a power cord separately (I have seen Amazon listings where disposals and power cords are sold together). The reason for not including power cords is they are not required if you already have a disposal, you can use the old power cord to connect the new. This saves you some money. Well, they are actually removable once you disconnect the disposal from the sink but they are not removable if you try that from the sink top. This makes it difficult to change a worn out splash guard.